outputDir - a directory where allure reports should be stored. Standard output directory is set by default. There are few public API methods which can be accessed from other plugins. Sometimes it takes some time for a page to respond to user's actions. Depending on app's perfromance this can be either slow or fast. For instance, if you click a button and nothing happens - probably JS event is not attached to this button yet Also, if you fill field and input validation doesn't accept your input - maybe because you typed value too fast. 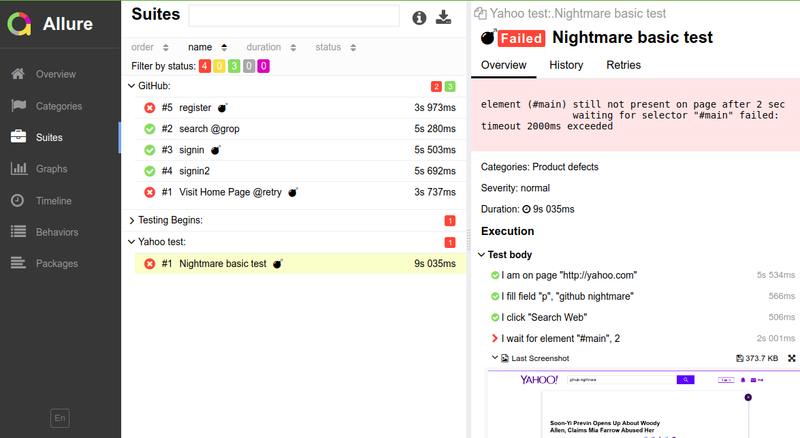 This plugin allows to slow down tests execution when a test running too fast. It puts a tiny delay for before and after action commands. Logs user in for the first test and reuses session for next tests. Works by saving cookies into memory or file. If a session expires automatically logs in again. For better development experience cookies can be saved into file, so a session can be reused while writing tests. Define user session names (example: user, editor, admin, etc). saveToFile (default: false) - save cookies to file. Allows to reuse session between execution. restore method is executed. It should open a page and set credentials. check method is executed. It should reload a page (so cookies are applied) and check that this page belongs to logged in user. After successful login, fetch is executed to save cookies into memory or file. If you decide to keep cookies between tests you don't need to save/retrieve cookies between tests. But you need to login once work until session expires. For this case, disable fetch and restore methods. If your session is stored in local storage instead of cookies you still can obtain sessions. Dumps puppeteers code coverage after every test. Configuration can either be taken from a corresponding helper (deprecated) or a from plugin config (recommended). First of all, your mileage may vary! Retries each failed step in a test. factor - The exponential factor to use. Default is 2.
minTimeout - The number of milliseconds before starting the first retry. Default is 1000.
maxTimeout - The maximum number of milliseconds between two retries. Default is Infinity. randomize - Randomizes the timeouts by multiplying with a factor between 1 to 2. Default is false. This plugin is very basic so it's recommended to improve it to match your custom needs. Creates screenshot on failure. Screenshot is saved into output directory. This plugin is enabled by default. uniqueScreenshotNames: use unique names for screenshot. Default: false. fullPageScreenshots: make full page screenshots. Default: false. Generates step by step report for a test. After each step in a test a screenshot is created. After test executed screenshots are combined into slideshow. By default, reports are generated only for failed tests. deleteSuccessful: do not save screenshots for successfully executed tests. Default: true. animateSlides: should animation for slides to be used. Default: true. ignoreSteps: steps to ignore in report. Array of RegExps is expected. Recommended to skip grab* and wait* steps. fullPageScreenshots: should full page screenshots be used. Default: false. output: a directory where reports should be stored. Default: output. screenshotsForAllureReport: If Allure plugin is enabled this plugin attaches each saved screenshot to allure report. Default: false. A complete list of all available services can be found on webdriverio website. Add service name to services array inside wdio plugin config. Install @wdio/selenium-standalone-service package, as described here. It is important to make sure it is compatible with current webdriverio version. Please note, this service can be used with Protractor helper as well! Install @wdio/sauce-service package, as described here. It is important to make sure it is compatible with current webdriverio version. In the same manner additional services from webdriverio can be installed, enabled, and configured. ... - additional configuration passed into services.